Tom Getty chats about the action movie he wrote, directed and stars in. A resurgence in old school action movies – like Olympus Has Fallen, The Expendables and Escape Plan – helped lead the way for Tom Getty’s 80’s action throwback America Has Fallen. 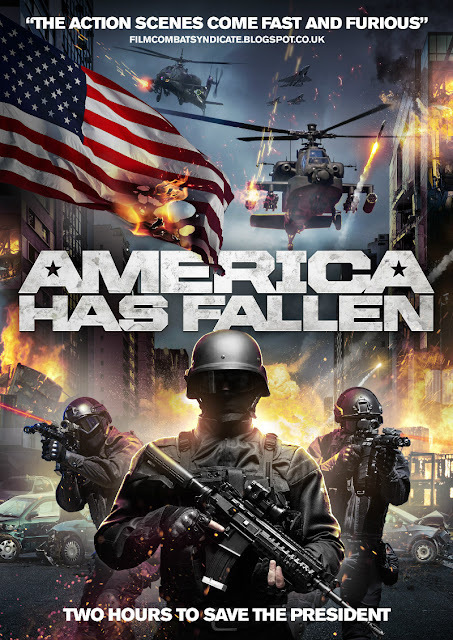 Now on VOD from High Octane Pictures, and striking a chord with action buffs everywhere, the film sees Getty give birth to a new action hero, Ryan Taylor, as he attempts to save the president. Do you recall when you sat down to write the film – and why? I sat down to write the film in spring of 2011. I'd finally gotten done with promotion for my last film, Emulation, and I was really, really eager to do another action movie. Then the Navy Seals finally located and killed Osama Bin Laden, and that changed everything with the story I wanted to tell. Did you sit down and watch a bunch of action movies as inspiration before or during the script-writing process? Not only do I sit and watch all of the action movies I can get my hands on, I make it a strict habit of my writing process to find the script, then grab a bunch of 3x5 notecards; I note what happens in each scene in each movie, and then I cross reference it with other movies like it. Just to get the underlying patterns, the chords, if you will. I'll go through maybe 30 movies. Sometimes I'll even seek out other movies that might not be considered "action." Like, I made a study of the movie Saw, because certain elements of that movie felt right for America Has Fallen. Did you write with a budget in mind – and therefore tried not to write in ‘too many’ huge explosions and costly stunts? I first wrote America Has Fallen for legendary action producer Arnold Kopelson, who did Platoon, Falling Down, Se7en, Eraser, and my all time, ALL TIME, favourite: The Fugitive. So I went for the huge set pieces, the exploding buildings, the helicopters hitting the bus - real Wagnerian-level action. He ultimately encouraged me to make the film on my own, and so I had to sit down and parse through what action was really important to the story. And it turned out: it all was! So, I figured out how I could do it all without any money. Everything in the movie was filmed on location. I wanted the whole thing to film as realistic as possible. In fact, this almost got pushed too far at one point. When we were filming the helicopter chase through downtown Pittsburgh, the Jeep Grand Cherokee vehicle came within inches of slamming into a parked car. That moment about took an entire year off my life, and almost gave me a few grey hairs. Which is why I left the shot in the final cut! It's a great moment! Why did you decide to play the hero? Had you been wanting to further your career as an actor and believed this was the best way to do it? I had met Tom Cruise when he was film Jack Reacher in Pittsburgh, and that had really made me want to play the hero of an action movie. Like, I got it, what moviemaking is all about. That the movie is about that person. And I've always loved acting. I love everything about making movies. I love to play the hero! Is an action movie only as good as its villain? Do you believe an interesting bad guy is as important as a compelling hero? We're only as developed as the conflict we come up against. Any movie is only as good as its villain. The villain is everything. Movies only ever happen because of the bad guy. Without Hans Gruber, John McClane just visits his ex-wife and heads back to New York. Without the Joker, Bruce Wayne just mopes in his cave. Without Murdoc, MacGyver just hangs around the Phoenix Foundation with Pete Thorton. Really, it's the bad guy who brings out the best in someone. And the villain of America Has Fallen brings out the absolute best in the movie's hero. On one level, the villain of America Has Fallen, Razanov, wants to nuke a US city. But, on another, it's his belief system that makes him almost unstoppable: "There is no greater fate… than death." Scary guy! The best all-time action movie is…. Die Hard. Maybe, maybe…The Dark Knight. Tough call. Best of the Die Hard movies? A tough, tough choice between Die Hard and Die Hard With A Vengeance. They're opposites in a lot of ways - one claustrophobic, the other momentous, almost apocalyptic. It's no coincidence that they're both directed by John McTiernan, who is a genius. Are those last two Die Hard movies really that horrible, in your opinion? Don't get me started! A Good Day To Die Hard should have been called A Good Day To Die Already! Although, I own it and the other one on DVD - ugh. What's the old line - we beat on, boats against the current, borne back ceaselessly into the past. The whole subject gets me a little misty-eyed. Why do you think there’s been a renewed interest in all these old action franchises? Even films like The Expendables – which is clearly an '80s film in modern-day clothing? The renewed interest in old action franchises is because of people like me who yearn for the old days when Hollywood made movies about John Wayne-type heroes. Characters who didn't mope, who just kept at something until it was fixed - even when everyone else had given up on them. Duty, honour, courage. Young people hunger for those great, timeless values - which is why I made America Has Fallen.